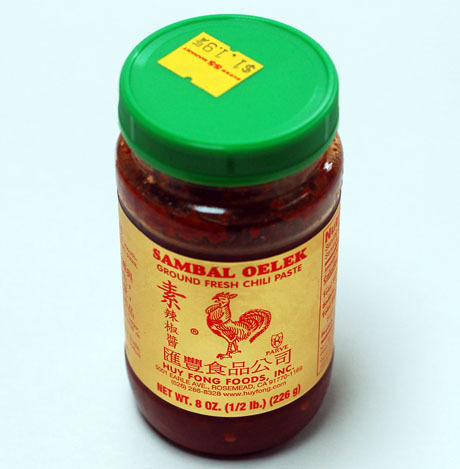 Use it as a glaze on your favorite meat, seafood and grilled fish. Glaze (brush) at mid cooking time, with the caramel at room temperature: roast pork, poultry or whole duck. Glaze just before serving, with hot caramel, cooked: shrimps, scallops, quails (and the list goes on). Procedure: 1. 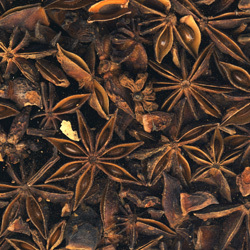 Grill in a skillet: anis flowers, cloves of garlic cut in two and peppercorns. The aroma will tell you when the roasting process is done. This should only take a couple of minutes. 2. Using a pestle and mortar crush the grilled spices and the coriander roots. Your spice paste is now ready. 3. In a wok or large skillet, brown the spice paste in the oil on medium heat until fragrant and golden. 4. Add sugar (broken up into smaller pieces) and fish sauce. Melt on medium heat while stirring with a wooden spoon. When all the sugar has melted (no solids remain except for spice blend), bring carefully to a light boil then turn off the heat (if the heat is too great, there is danger of flash-foaming and overflow on your range [big mess, lots of smoke], so at first sign of foaming, remove the pan from the heat). 5. If you hot-pack the caramel into Mason jars, it will keep for a very long time (refrigerated or not). room or fridge until Christmas. 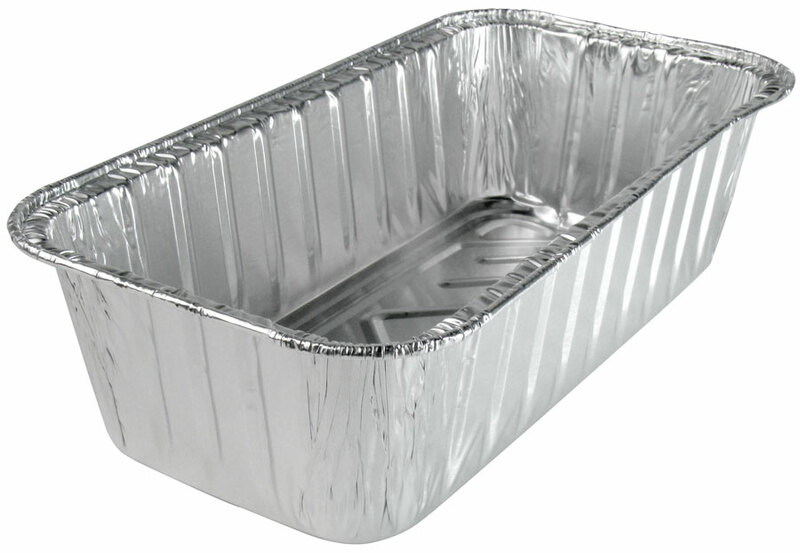 Molds: use bread loaf pans or disposable foil loaf pans with interior dimensions close to: 8" long, 3.75" wide, 2.5" deep (20cm x 9.5cm x 6cm). Be sure to grease the molds to make unmolding easier. Procedure: 1. Mix baking powder with sieved flour in a large bowl. Add nuts, cherries and dates. Mix well. 2. In another bowl, beat eggs, vanilla, salt and sugar . 3. Combine the two preparations, mix very, very well, and pour in the two molds . 5. Age for 2-3 months in a dry and cold place (remember to keep your cakes from rodents if you age them in the basement). makes two loaves, 475g each. Express recipe for beginners and bakers with little time. This bread is dense so there is no need for a mold. has no problem wathsoever making this bread, alone. - 308g (1cup +2/3 cup) wholemeal flour (wheat, organic): this flour contains the whole wheat grain (bran, endosperm and germ). **I used the KitchenAid Artisan 5-Quart 325W for this recipe. It comes with whip, spatula and hook. You can also knead the dough with your hands but it takes longer (15 minutes, instead of 10 with the mixer). The kneading process implies folding the dough in two and then pushing it, in order for the folds to disappear. Play with the dough vigorously. If you intend baking bread every week (or having your kids make the bread), buying a mixer would be a good idea. Making bread weekly would also be a great idea. ***Make sure the active yeast you use is still active! If it hasn't been used for some time (or not refrigerated once opened): mix 7g (1 packet, 1/4 oz, 1/2 tablespoon) of instant yeast with 1/4 cup of warm water (100-110°F or 37-43°C) in a coffee cup. Mix in a teaspoon of sugar. 10 minutes later, this mixture should have doubled in size. After 30 minutes, we're talking volcanic eruption! ****The teaspoon of sugar is not compulsory. It helps the yeast to activate more quickly. In the winter, when room temperature are cooler, the sugar helps maximise the rising of your bread. But you'll have edible bread with or without using sugar. *****Here is an example of a whole grain and dried fruit mix that works well: 150g raw, unsalted sunflower seeds, 30g whole flax seeds, 20g whole chia seeds, 25g whole sesame seeds, 75g dried cranberries (sweetened or not). 2. Replace the whip with the flat spatula. 3. Add about half the white flour (200g), half the wholemeal flour (154g), 2 teaspoons salt and all of the fruit and grain mix. 4. Mix all these ingredients for 1 minute at low speed. (If your are not using a mixer, mix with a large wooden spoon). 5. LIft the mixer and remove the dough from the spatula before replacing it with the dough hook. Add the remaining other half of flour (200g white and 154g wholemeal), if you are not using a mixer, gather your mix and get it ready to knead on a well floured surface (table, countertop). 6. Knead 5 minutes at first speed and another 5 minutes at second speed. If the mix becomes stuck in a ball around the hook and simply spins around the bowl, stop the mixer and remove the dough from the hook, tear it in two and start the mixer again. A proper kneading is important and you will need to repeat this procedure if this happens again. The size of the bowl used in relationship with the amount of dough in the bowl can have an impact on the kneading efficiency of the mixer. This recipe (2 loaves of bread) works well with a 4 litre mixer. You can't really mix more dough with this size mixer without risking it being overworked and eventually breaking down. Where kneading is concerned, more is preferable to less. (when using your hands to knead the dough, fold repeatedly in two and then in four before pushing it all down and starting again, as described earlier in **. Massage the dough 3 times in this fashion during 5 minutes each time). 7. Stop the mixer, sprinkle flour on your fingers before you remove the ball of dough from the hook; the flour will help you deal with the stickyness of the dough. 8. Brush the interior of a bowl (glass,plastic, metal) with olive or vegetable oil. Your bowl should be able to hold twice the volume of the unrisen dough ball. Roll the dough ball around in the bowl so that it is completely covered with oil. Cover the bowl with plastic wrap, let the dough rise for an hour in a warm place (top of the fridge, near a sunny window...) The warmer (at least >20°C) the environment the better. 9. 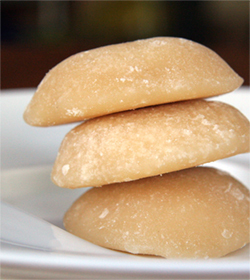 Place the risen dough ball on a large biscuit pan covered with parchment paper (or silicon mat), cut it precisely in two with a spatula and place the two pieces far enough one from the other so that they have enough room to rise and reach their full volume (1 1/2 their actual size). The pieces should be placed torn side down so that they are siting on their cut. Again (see * above), if you don't have a big enough pan, use two smaller ones. 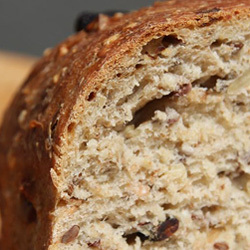 This procedure can only be followed if you are making bread with lots of grains; if you had only used plain white flour and no grains, the bread would not hold together and you would need a mould. 10. The next step is critical for the proper rising of the dough. Place the pan on the middle shelf of the oven. Place another container full of very hot water (at least a litre) under the bread pan (a glass lasagna type dish or other metal container will do). Turn on the oven light. This warm and damp environment will help the dough rise further. Let the dough rise between 60 (in a rush) and 90 minutes (if you can). CAREFUL: the oven temperature should be between 85°F and 100°F (30°C-38°C) so if you have used the oven earlier on, make sure it has had time to cool down. In winter, you can heat the oven for a minute before going through with this step, but the hot water usually provides the correct temperature. 11. Now for the baking of the bread: Remove the pan from the oven and turn on the thermostat to 450F (230°C). You can keep the hot water container in the oven. Try to keep the bread from getting cold while waiting for the oven temperature to rise (maybe put it on top of the fridge). In the summer there is no such problem. Do not shake the pan; cold and shock might deflate the bread. Before placing the bread in the oven to bake, first spray water at the bottom of the oven (approx. 1/8 cup).This procedure will help give colour and texture to the bread crust. You need to proceed quickly as to not lower the oven's temperature while you spray with the door open. 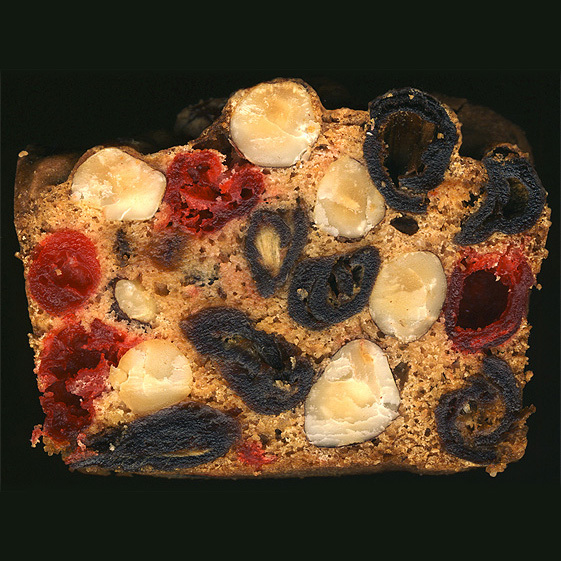 Following the spraying of water, put the bread in the oven. Repeat the spraying procedure after 5 minutes baking time and again after another 5 minutes. After this 10 minutes of baking at 450°F, lower the oven temperature to 375°F(190°C) for between 20 and 30 minutes. 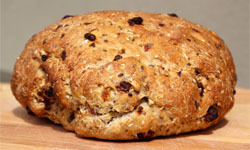 If you want a softer bread (not for toasting), bake at 450F for 15 minutes and then at 350°F (175°C) for 10 minutes. Spray the bottom of the oven every 10 minutes. When the bread is golden, take the pan out of the oven and put the loafs on a cooling wire rack (you can use an oven grid which was removed from the oven beforehand). The interior of the loaf keeps on cooking for about an hour while the exterior cools down. After an hour you can indulge in a slice. This bread is delicious and wholesome toasted for breakfast. It can be frozen in a plastic bag or kept in the pantry for a few days in a non vacuum bag (or bread bag). Delicious as is or in a salad. - 2 1/2 cups (about 500) walnut halves or big chunks. The smaller the pieces, the more lenghty the setting of the nuts on the cookie sheet will be. Procedure: 1. Mix egg white, brown sugar, cinnamon and salt in a large bowl whipping the preparation as you go along. When the mix is homogeneous, add the walnuts and toss to coat each nut. 3. 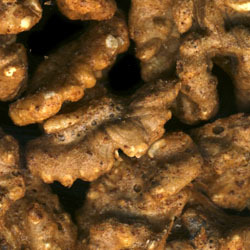 Place a parchment paper on a cookie sheet and set the walnuts next to one another until the whole cookie sheet is full. Make sure the nuts don't touch one another. Before you set them on the cookie sheet, let them drip between your fingers a few seconds and be careful not to drip meringue all over the paper. 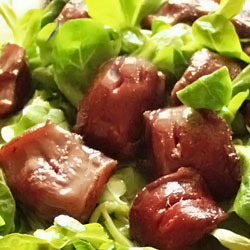 - Enough greens (mixed baby lettuces, arugala and herbs) to fill a plate (start with this step when preparing this dish). Season the greens with olive oil, salt and freshly ground pepper. Procedure: 1. Pan-fry gizzards on medium heat. 2. When the gizzards are warm, turn off heat and add the star anis caramel, coating each piece completely as it melts. 3. Place the cheese and walnuts on the greens, finishing with the glazed gizzards. 4. 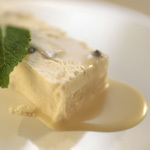 Add a small amount (1 tablespoon total) of oil and vinegar in the frying pan where the glazing caramel was melted, scrape the mixture to obtain a warm vinaigrette which you will add to the greens before serving. 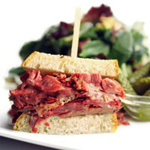 The original Naked Lunch bistro's chef-owner recipe! A sweet, salty and very spicy asian inspired salad. to find all the ingredients. 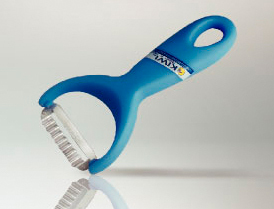 - 1 Wavy-bladed-peeler which produces fine papaya sticks. A mandolin will also do the job but watch out for your fingers! 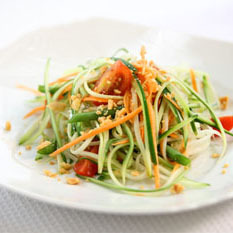 - 1 very firm green papaya around 1 kg (yields 800g: 4 servings as meals, 8 as starters). Condiments: 1/2 cup crushed cashew nuts (salted and grilled), bunch fresh mint or thai basil or both. Procedure: 1. Peel papaya until you reach the heart of the fruit (stop when you see the white seeds). 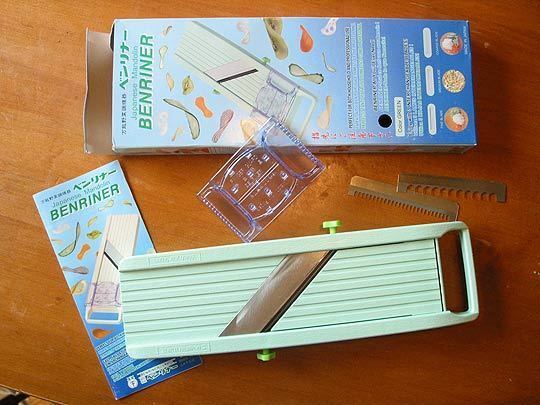 Don't use the green peelings. Don't forget that the green papaya is a papaya that is not ripe. 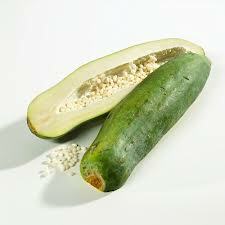 The green papayas' flesh is white with white seeds and the ripe papaya's pulp is orange with black seeds. 3. Prepare portions individually (this allows you to adjust the amount of dressing and condiments each guest will have). For a starter, mix 100g papaya, 2 tablespoons dressing, 1 tablespoon crushed cashews and 1 tablespoon minced fresh mint and thai basil. 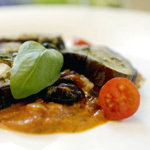 For a meal, double these quantities and add grilled seafood or very thinly sliced flat iron grilled steak. This salad is delicious served with shrimp chips. There are many ways to make yogourt. - a reliable thermometer. I suggest a good electronic one for precision. 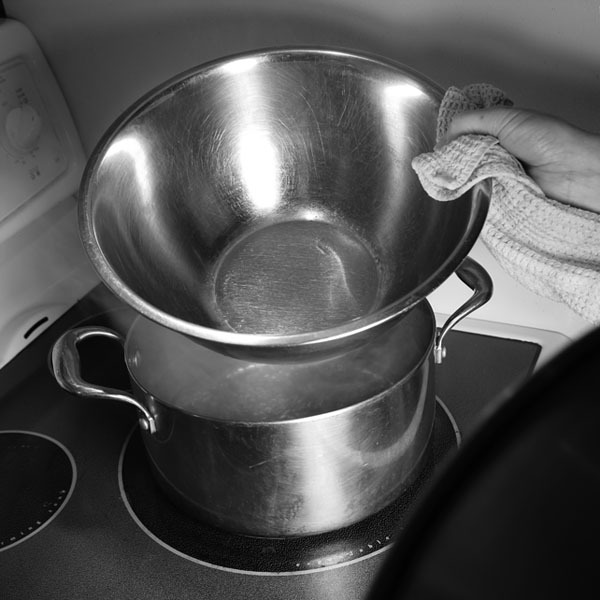 - a double boiler: the one I suggest is quite simple: a large and light stainless steel bowl over a cauldron. Here is my system. 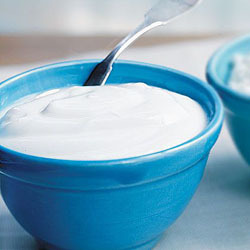 *The first time you make yogourt you will need to get an active bacterial culture. I suggest you choose the best yogourt you can find in a health food store. Choose it plain, organic if you want; it can be either goat, cow or sheep yogourt. It is IMPORTANT that the yogourt is very fresh so check the "Best before" date. A great choice in Québec is the one produced by La fromagerie du Troupeau Bénit, if you can find it. To make your first batch, use 3 tablespoons of your fresh, store-bought yogourt. With the remainder of the yogourt, prepare 20ml frozen portions that will be used to start off future batches (20ml is the average volume of standard ice tray compartments). Once the portions are frozen, you can store them loose in a freezer bag. Of course, after your first batch, you can make as many cubes as you want with your own yogourt. Remember, however, always to use the freshest yogourt to get the most active bacterial cultures. A yogourt that is a few days old is much less potent than a yogourt made the same day. Sarting fresh batches from whatever yogourt's left in the fridge is a practice that will give you ever weaker bacterial strains and ever thinner yogourt. 1.Heat the milk in a double boiler until it reaches 93°C (200°F). Keep this temperature for 20 minutes, whisking fairly often with your thermometer or whisk. According to Doctor A. Nummer from the «National Center for Home Food Preservation» U.S.A., this step will produce a thicker yogourt. 2.Take off the heat, replace hot water with cold water in order to cool the yogourt to 46°C (115°F). This temperature corresponds to the incubation temperature of the yogourt. 3.Pour a bit of the lukewarm yogourt in the container used to incubate the yogourt ( i.e. the system chosen that can maintain hot milk between 42-46·C (108-115°F) for between 4 to 7 hours), add the bacterial culture (3 tablespoons of fresh yogourt or 2 of your 20ml cubes of frozen yogourt which have been thawed in the refrigerator) and mix the two. Then, add the rest of the lukewarm milk and mix again. 4.Incubate between 4 to 7 hours. The longer the incubation, the thicker the yogourt and the more acid it becomes. The warmer and the more stable the incubation temperature is (max. 46°C/115°F) the quicker the yogourt will set. Experiment with different times to see what you prefer. 5.Check the yogourt after 4 hours to see if it has started to set. If it is firm enough, go the the next step, otherwise check after another hour and so on until it has been 7 hours. If it still not firm then, check for possible problems in the troubleshooting section. Generally the yogourt is perfect after 5 hours and becomes to acidic after 7. Lower temperatures can slowdown the process beyond 7 hours, but you should try to fix your incubator to get more consistant results. 6.Refrigerate promptly to stop incubation. When cold, you can let the yogourt drip from a cheese cloth or chiffon bag to make it even thicker (5 hours is a good starting minimum for this step). If the milk is not fresh enough, it will not set. It might even separate during the heating step. If the milk is too hot when adding the bacterial culture, it will kill the culture. If the bacterial culture is not fresh enough, the yogourt will not set. If the incubation temperature is too low (<40°C/105°F) and not constant enough, the yogourt will take longer to set. Wait and see for up to 8-9 hours. Beyond this, try again!